Here is a GIANT giveaway for you! It is your chance to win a KING KUSH SAK! Enter to win below using the Rafflecopter!! It looks so comfy, and what I like most is that it truly is adult size. This looks like it would be GREAT for my aching back! I love how HUMONGOUS it is! and I really like the chocolate color of the one in the pic. I love these big ole comfy looking saks! I'd love to have one! I love this! It is big enough for a "real" adult! I love how all my children can fit onto-what a cool product! I would love to win this, we are re-doing our living room with this type of furniture. It is so comfy, we have one chair like it and we all fight over it. So comfy. Perfect for snuggling. This is truly perfect for me, it looks so comfortable and so soft! I'm here again... this very nice and looks so comfy good for the bedroom. 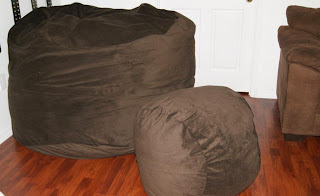 I love that bean bag in your photo! I would love to have one.. It looks like such a cozy addition to a media room or similar. I love how it's so big, Shawn and I could both snuggle on this together!